Hello there! Last week was my dear friend Dave’s birthday and it was also our turn to host our monthly Comfort Food Dinner. My Comfort Foodie Friends had asked me to prepare Spanish Comfort Food for them and what better Spanish Comfort Food is there than Paella? So, in honor of Dave’s birthday I am today going to give you a paella making tutorial. 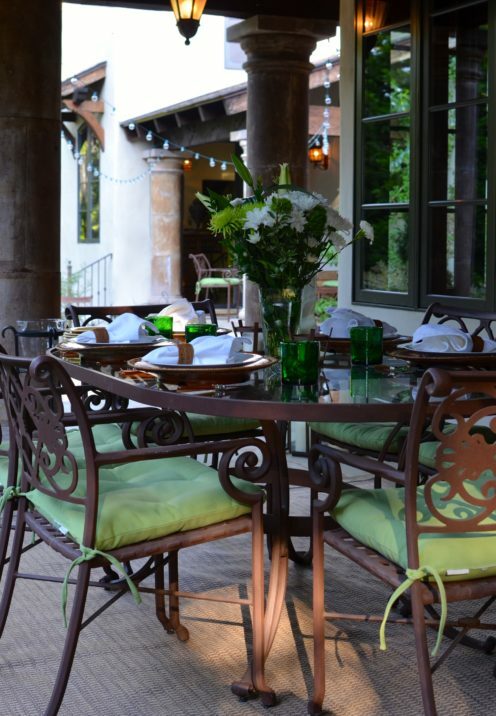 It was a glorious evening in beautiful Lake Arrowhead so we were able to enjoy pre-paella cocktails and appetizers on the terrace for the first time this spring. 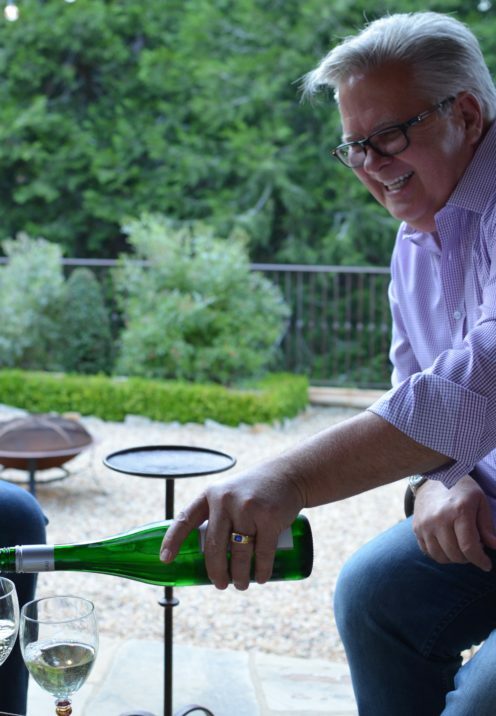 We toasted Dave with a great bottle of refreshing Riesling wine that we had brought back from our recent trip to Europe. And I served delicious cheese from our visit to Point Reyes Homestead Cheese Company. By the way, I’ve shown you how to make paella for a large crowd in a previous post using my huge outdoor paella pan and burner, but that recipe serves over 30 people. Today I’m going to show you how to make a scaled down paella recipe that serves 8 people with leftovers. 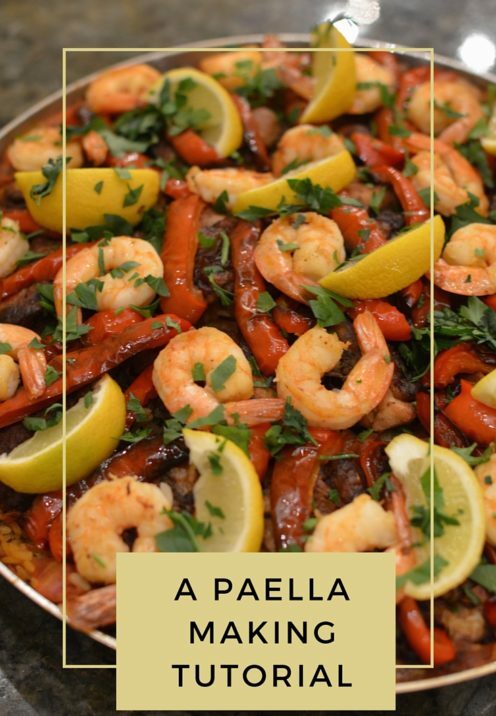 My paella recipe is reminiscent of a traditional Paella Valenciana, but made with chicken and shrimp, and without other shellfish like clams and mussels which are often added to seafood style paellas. But now let’s back up to earlier in the day when I prepared the Paella. 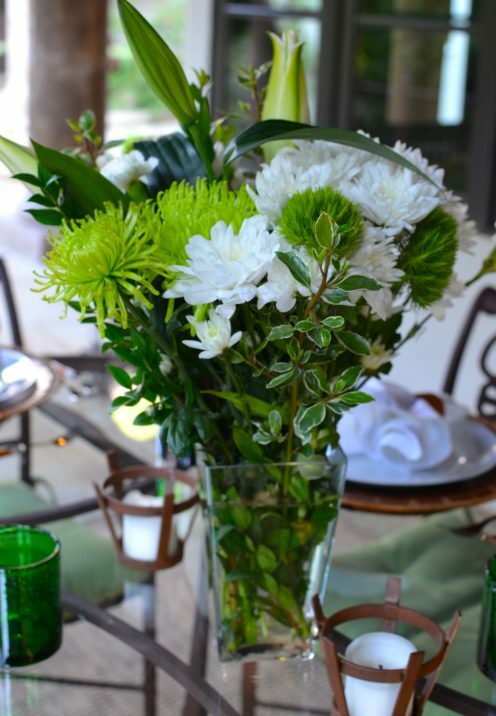 As I’ve told you many times, when I entertain I like to do as much advance prep as I can, so I too can enjoy my guests instead of being cooped up in the kitchen when I’d rather be drinking wine on the terrace. Paella is actually a great make-ahead dish because it can be prepared ahead and kept warm in a very low oven or in a warming drawer until it’s time to serve it. And it’s also even more delicious the next day for leftovers. Paella does take a good amount of time to prepare and therefore you should allow about 3 hours for the whole process. It’s a labor of love which makes it a special dish to serve for a special event. 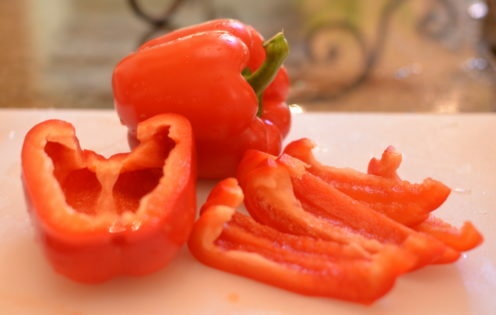 Remove the seeds and then slice the red bell peppers into long, 1/2″ slices. Dice 2 medium size brown onions. 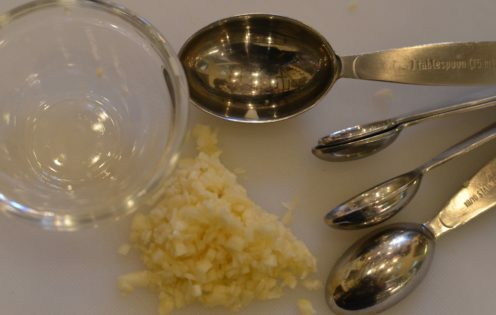 Mince about 5 cloves of fresh garlic to achieve 1 tablespoon of minced garlic. Using a meat cleaver, cut your 8, bone-in chicken thighs in half, cutting right through the bone. 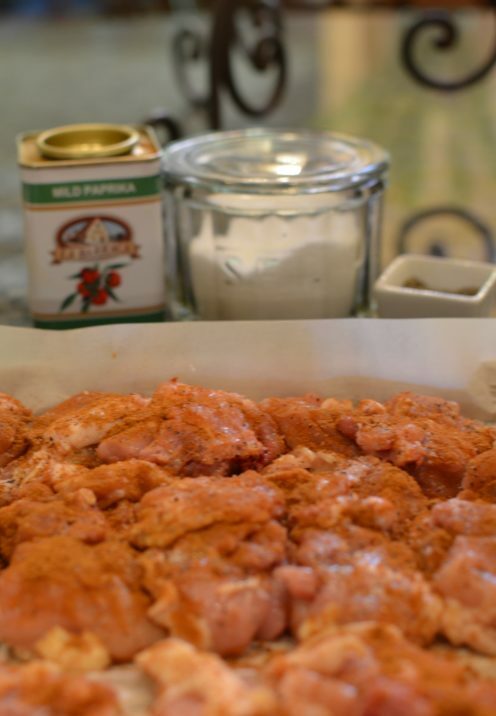 Sprinkle the chicken pieces with kosher salt, coarsely ground pepper and mild, sweet Spanish paprika on all sides. 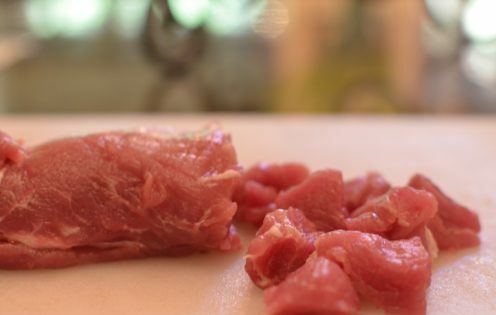 Dice the pork loin into 1/2″ cubes and sprinkle on a little Kosher salt. 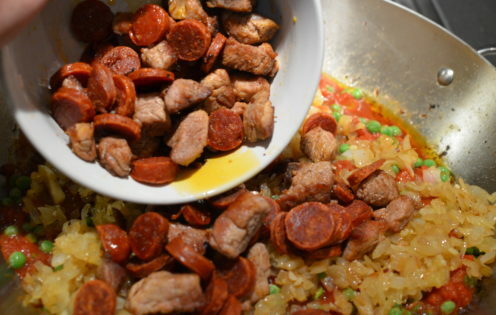 One of the most important ingredients in this type of Paella is authentic style hard Spanish Chorizo sausage which imparts a very unique flavor to the paella. 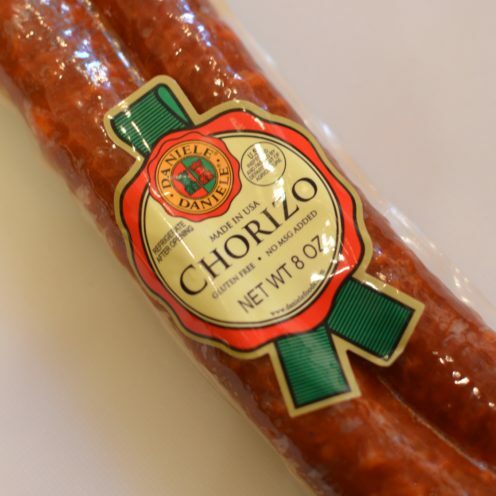 It is entirely different than the soft, Mexican style Chorizo that is easy to find in most supermarkets. PLEASE DO NOT EVEN THINK ABOUT USING SOFT, MEXICAN CHORIZO in this recipe. 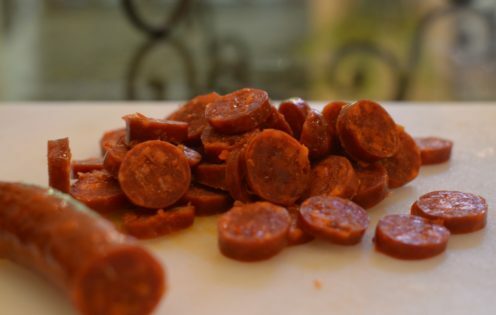 I have found that the Daniele brand of chorizo is delicious and authentic tasting. You can purchase it by clicking here. 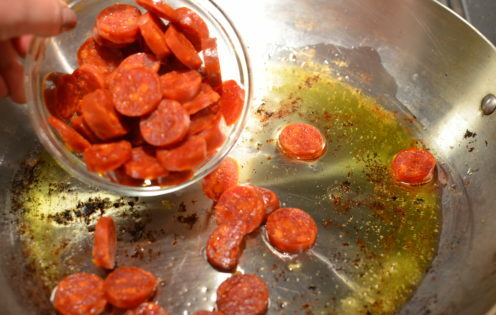 Cut the chorizo into 1/4″ slices. Mince 1/4 cup flat leaf parsley. 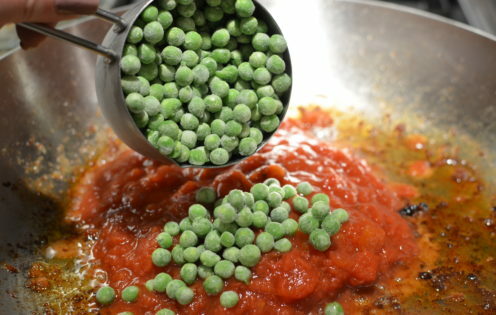 Now, set all of your prepared ingredients aside so they are handy when you need them. Another vital ingredient in Paella is Spanish Saffron. Saffron is very expensive but is worth every penny you will pay to give your Paella and authentic flavor and distinctive coloring. If it is not available in your local supermarket you can purchase it by clicking here. 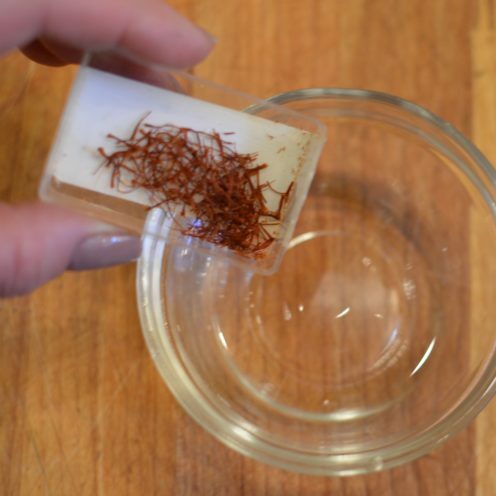 Saffron needs to soften before use. 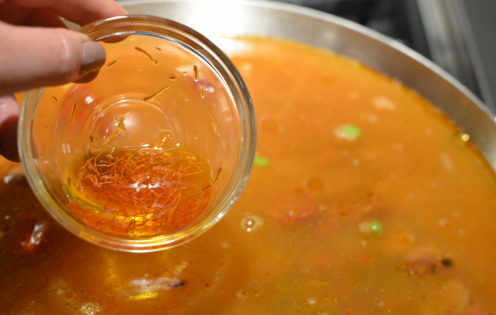 This is done by adding 1 teaspoon of saffron to 1 tablespoon of warm water. Give it a little stir and set it aside for later. Another essential component to the proper making of Paella is to have a proper paella pan. I own several paella pans in a variety of sizes but when I’m making a smaller quantity of paella (this recipe serves 8) I like to use my stainless steel, 13″, deep dish, 4-quart capacity, All-Clad Paella Pan. It is the perfect size to accommodate this recipe. 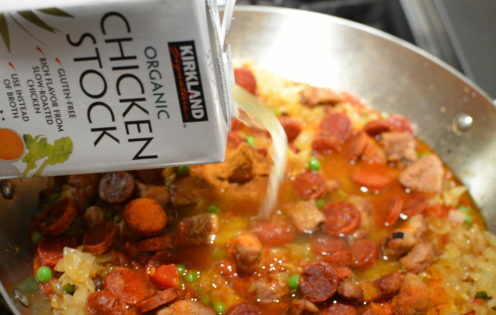 If you don’t have a paella pan I strongly suggest that you purchase one before attempting this recipe. Using the proper tools for the job will produce a good outcome. You can purchase an All-Clad Paella Pan like mine by clicking here. So, now that we have assembled and prepped all of the necessary ingredients and equipment we can begin to prepare the paella. Start by adding enough extra virgin olive oil to coat the bottom of your paella pan. 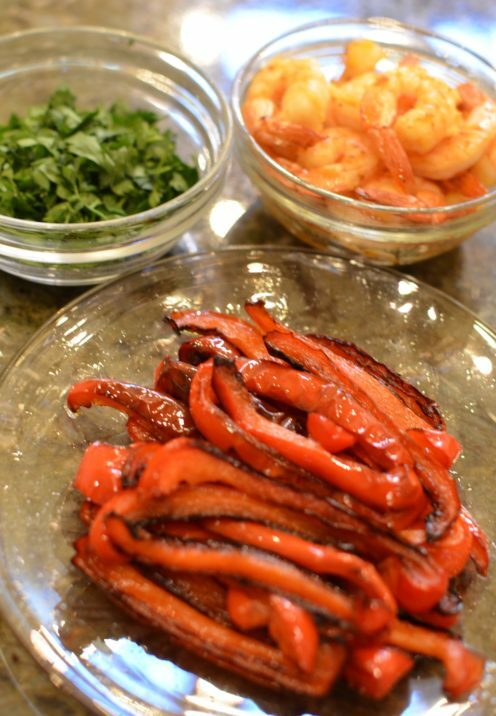 Adjust the heat to medium and add your sliced red bell peppers to the pan. Saute until they begin to soften and brown. Then remove them from the pan and set them aside. 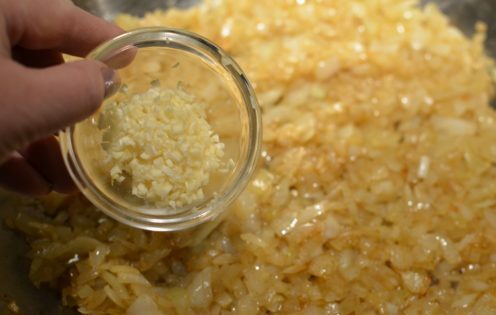 Now add the diced onions to the oil, which you will notice now appears yellow. 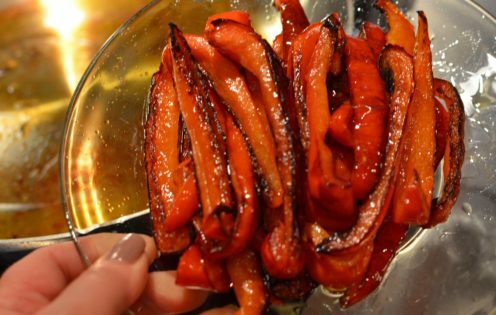 That’s because the bell peppers have imparted their lovely tasting essence to the oil, giving flavor dimension to everything that follows. Saute the onions over medium heat until it becomes translucent and begins to caramelize. Stir in the minced garlic and saute for a brief minute. 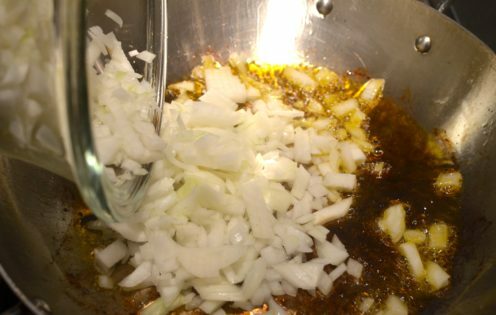 Using a slotted spoon, remove the onion and garlic mixture from the pan and set it aside, allowing as much olive oil as possible to remain in the pan. If necessary, add a bit more olive oil to coat the pan and then add the chicken, skin side down at first. 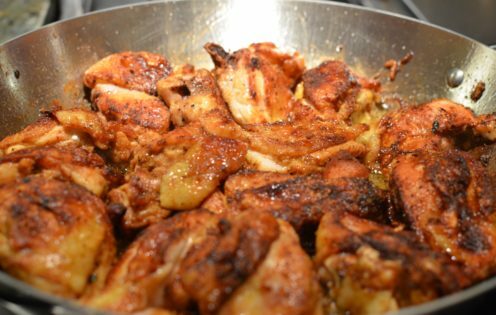 Saute the chicken over medium heat until it is golden brown, the skin is crispy and the meat is cooked through. Using a slotted spoon, remove the chicken from the pan and set it aside. along with your pork loin and saute until cooked through. 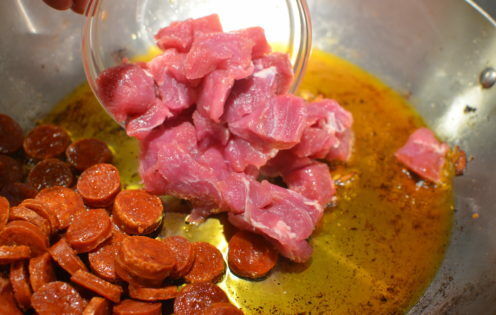 Remove the chorizo and pork from the pan and set it aside. Now add the shrimp to the pan and cook, turning once until the flesh turns pink. This only takes about 2 minutes. Remove the shrimp from the pan, cover them to retain the heat and set them aside as well. along with the sauted onions and garlic to the paella pan. Next, toss in the chorizo and pork loin and give it a good stir, scraping up and deglazing those lovely bits and pieces from the bottom of the pan as you do. Now comes the part that is a bit unconventional as authentic paellas go. 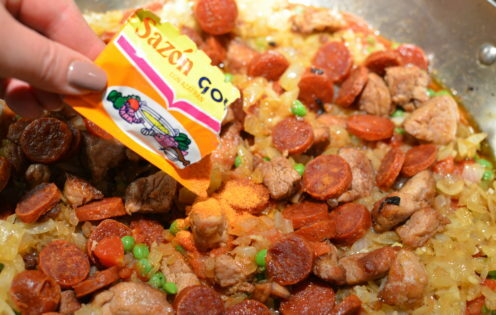 I like to add 2 packets of Sazón Goya Seasoning to my paella recipe. This is not something ordinarily done in Spain but I think it adds a little more saffron kick and color to my paella so I do suggest you try it as well. If you can’t find Sazón Goya Seasoning in your local grocery or Latin Supermarket, you can order it by clicking here. Next add 6 cups of chicken stock to the pan and give it a stir. and the 3 cups of rice. 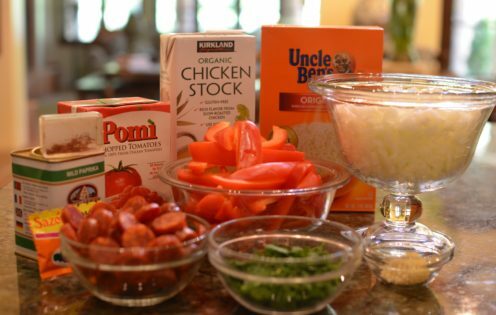 Now, it is also not typical to use Uncle Ben’s Converted Rice in the making of authentic Spanish paella. In fact, I doubt you could even purchase this type of rice in Spain. Spaniards use a short grain rice like “Bomba Rice” produced specifically for paella. However, I find rice to be difficult to cook just right, especially Spanish paella rice. It often comes out sticky and pasty instead of a tiny bit al dente and flaky, the way I prefer rice. To avoid the inevitable pitfalls of preparing rice, I along with many Spanish expats I know, use Uncle Ben’s Converted Rice in the preparation of paella. I’m sold on it and I highly recommend it, although I can see my Spanish grandmother turning over in her grave at this very moment! 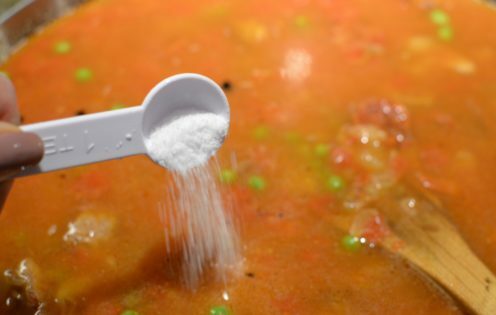 and add 1 1/2 teaspoons of Kosher salt along with 2 teaspoons of Sweet Spanish Paprika. Mix to combine all of the ingredients. 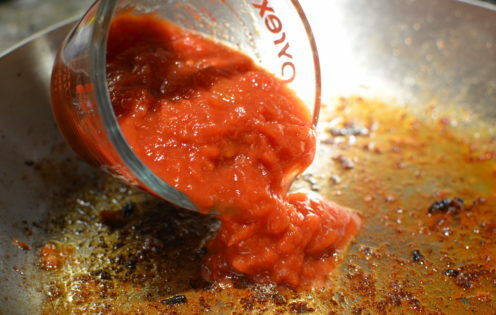 Again, it is important to use Spanish Paprika to achieve an authentic tasting paella. Some people use Spanish Smoked Paprika but I think smoked paprika overpowers the other subtle flavors in the dish. 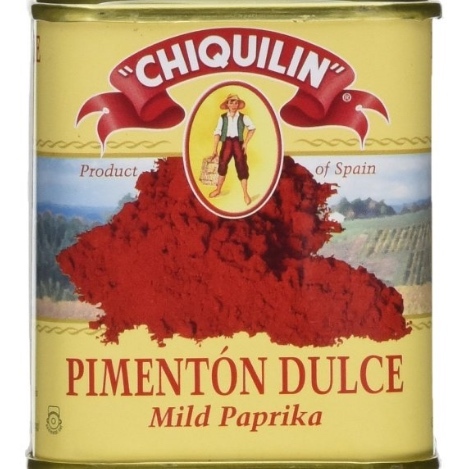 Instead I recommend using this mild, sweet Spanish Paprika (Pimentón Dulce) which you can purchase by clicking here. Returning to your prepared chicken, turn the heat down to the lowest level and place the chicken pieces artfully around the top of the pan. 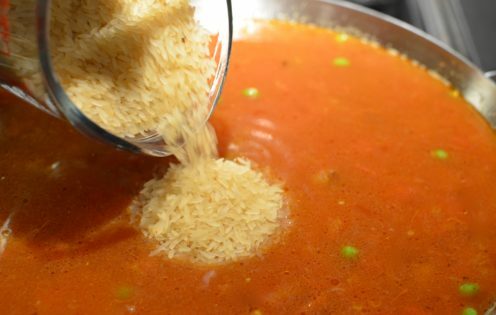 Cover the pan and cook over low heat for about 45 minutes or until the rice is tender and all of the liquid has been absorbed. 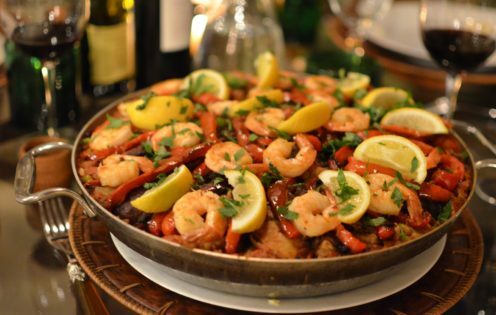 Just before serving arrange the bell peppers, shrimp and lemon wedges artfully on top of the paella. 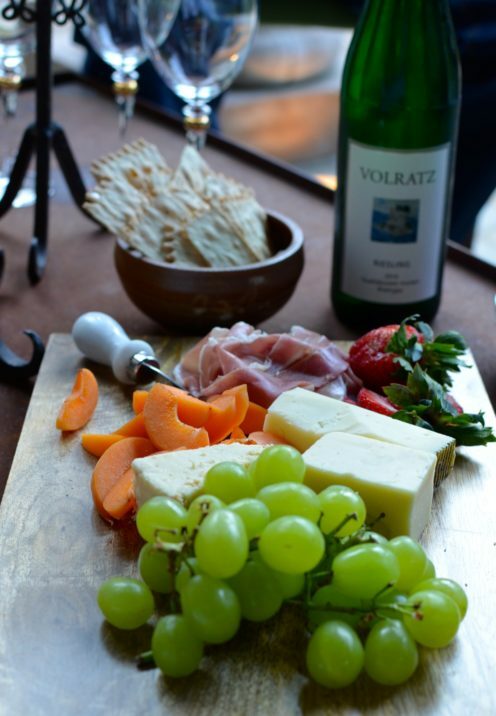 and serve to your very happy guests. 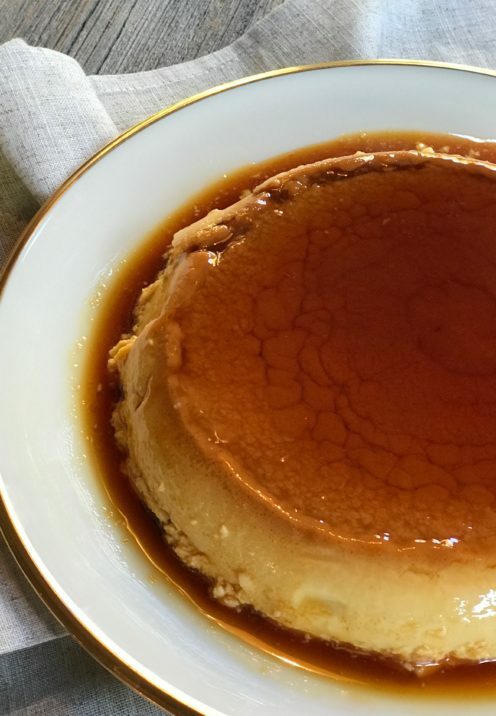 And for dessert try my Grandmother’s delicious Spanish Flan recipe. Then your Spanish feast will be complete! 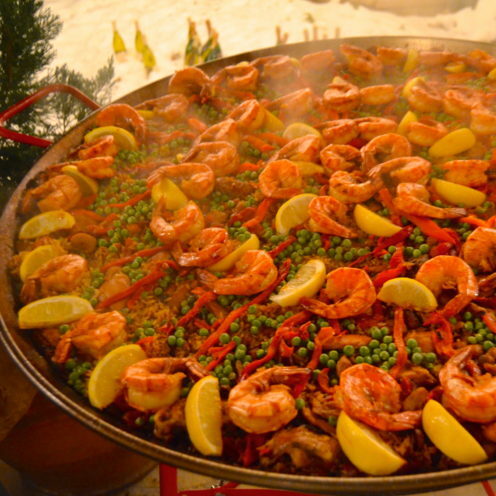 Paella is the national dish of Spain and is made in numerous different ways depending on the region. 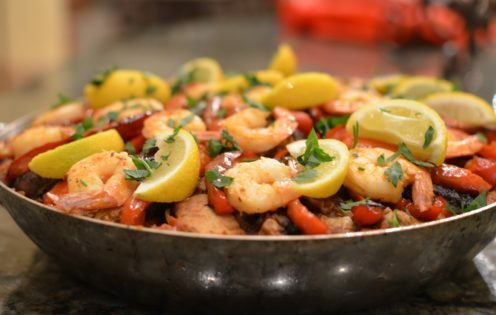 My delicious paella recipe incorporates pork, chicken and shrimp. Please plan ahead when making this recipe as it requires the proper equipment, ingredients and time to prepare it properly. If you do that you will be very pleased with the outcome. 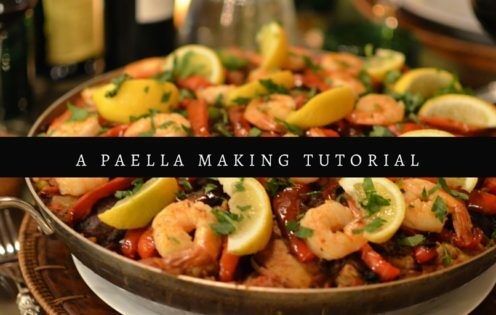 Visit my blog for a step-by-step pictorial on making paella. Adding enough extra virgin olive oil to coat the bottom of a 4 quart paella pan. 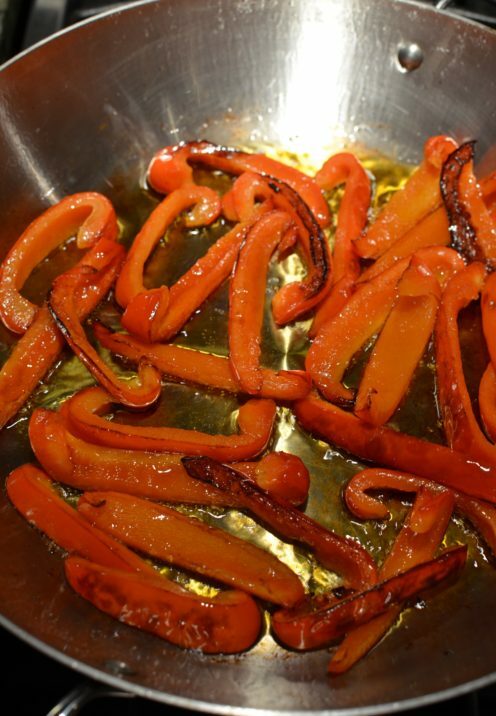 Adjust the heat to medium and add the sliced red bell peppers to the pan. Saute until peppers begin to soften and brown. Then remove them from the pan and set them aside. 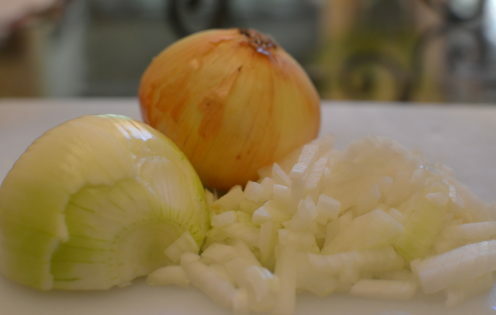 Add the diced onions to the oil and saute over medium heat until they become translucent and begin to caramelize. Stir in minced garlic and saute for a brief minute. 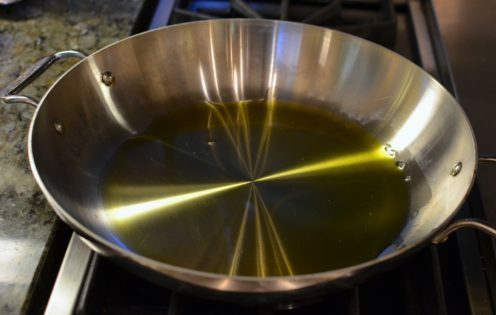 Using a slotted spoon, remove the onion and garlic mixture from the pan and set it aside, allowing as much olive oil as possible to remain in the pan. If necessary, add a bit more olive oil to coat the pan and then add the chicken, skin side down at first. Saute the chicken over medium heat until it is golden brown, the skin is crispy and the meat is cooked through. 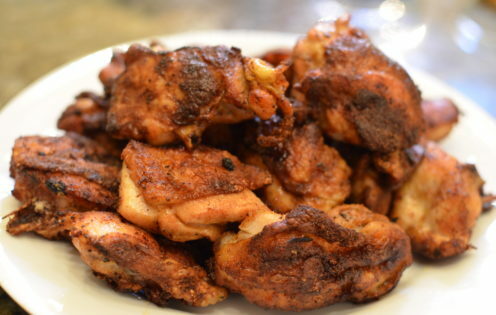 Using a slotted spoon, remove chicken from the pan and set it aside. Sprinkle the pork loin with a bit of Kosher salt . 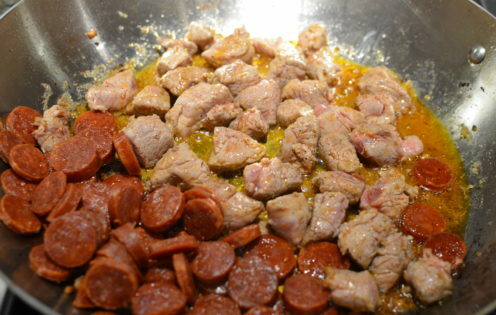 Add the pork loin and Spanish chorizo to the pan and saute until cooked through. Add the shrimp to the pan and cook, turning once until the flesh turns pink. This only takes about 2 minutes. 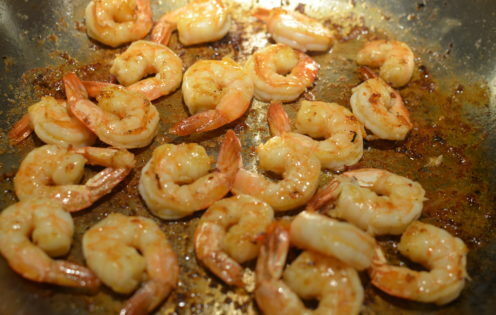 Remove the shrimp from the pan and set them aside as well. 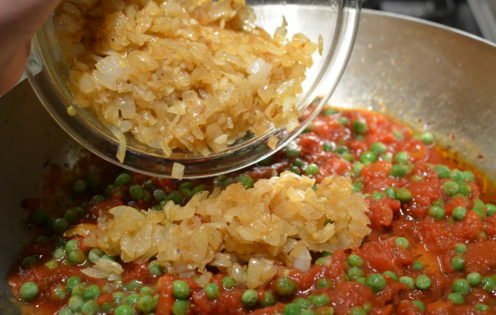 Add the canned diced tomatoes, the frozen peas and the sauted onions and garlic to the paella pan. Toss in the chorizo and pork loin and give it a good stir, scraping up and deglazing the bits and pieces from the bottom of the pan as you do. 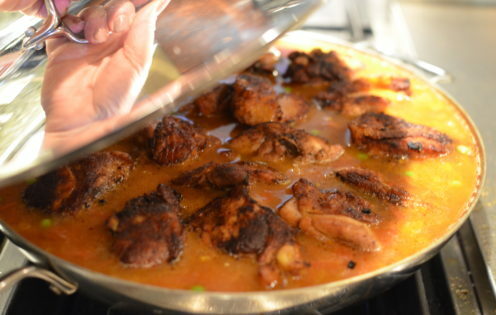 Add the Sazón Goya Seasoning, chicken stock, saffron along with the water, rice, Kosher salt, paprika and stir to combine. 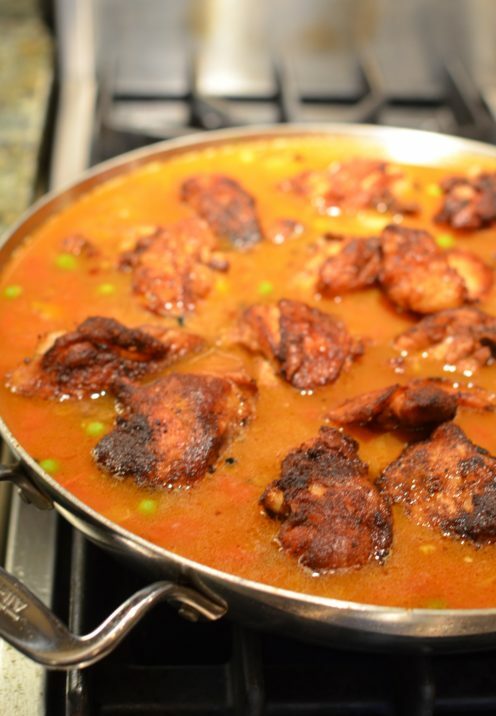 Turn the heat down to the lowest level and place the chicken pieces artfully around the top of the pan. 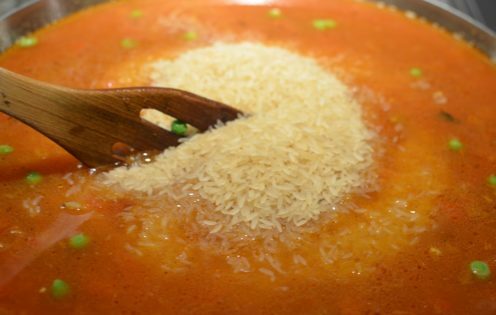 Cover and cook over low heat for about 45 minutes or until the rice is tender and all of the liquid has been absorbed. 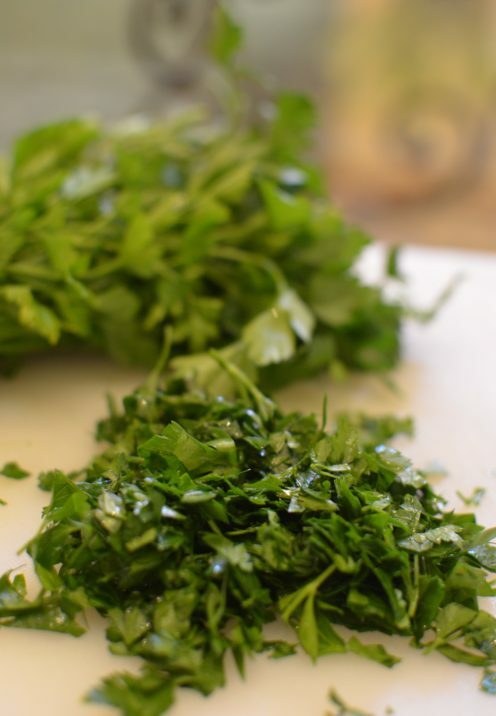 Sprinkle with fresh parsley and serve to your happy guests. All opinions expressed in this post are my own. Unless otherwise credited, all photos are the original property of Celia Becker @ www.AfterOrangeCounty.com and may not be reproduced without specific permission. This post contains affiliate links.